GIFT will reconvene in the Fall of 2018. But feel free to familiarize yourself with with this FAQ, or download this brochure for more details. In contrast to a traditional Sunday School, GIFT is a monthly event, for all ages, and includes a meal. At every monthly GIFT event, we meet together to share lunch and prayer, then participate in an opening activity to prepare our hearts and minds for the GIFT experience. A hands-on learning experience in small groups follows, during which we build relationships with each other and Christ. The groups then come together to share our learning experiences, to receive resources to apply in our daily lives, and to share each other’s prayer needs. We leave equipped to live as disciples of Jesus, ready to engage in service and mission to each other, Advent, and the world. UPDATE When does GIFT meet and what will we talk about? It is likely we have a giant in our lives. This giant holds us captive, intimidating us with its taunts and chipping away at our joy. Before they gain a foothold in our hearts we need to remember that God has a plan for us. With God’s plan we live in victory and He silences our giants once and for all. 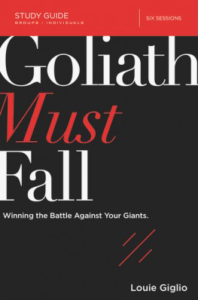 In Goliath Must Fall, Pastor Louie Giglio examines the story of David and Goliath to reveal how we must slay the giants of fear, rejection, complacency, anxiety, anger, and addiction in our lives. The six-session video study shows how the key to living free from our giants is not better slingshot accuracy but keeping our eyes on the one and only giant-slayer: Jesus. Put your hope in him, and watch Goliath fall. Louie Giglio is pastor of Passion City Church and the founder of the Passion movement. Passion has gathered collegiate-aged young people at events across the U.S. and around the world, uniting them in worship, prayer and justice. Louie is an engaging pastor who reaches individuals of all ages using Bible lessons while sharing with us his own giants. GIFT this year will be one hour in length. We will spend 25 minutes watching the DVD, 25 minutes discussing what Jesus is saying to us and 10 minutes learning how to apply this to our daily lives. Please feel free to bring your own packed lunch with you if you so choose to eat as we watch the DVD. Why is GIFT intergenerational? Can I attend GIFT if I do not have children? The GIFT intergenerational approach to faith formation is based upon a Biblical model. In Exodus, the people of Israel were instructed to teach their children about the reasons they celebrated the various festivals. GIFT at Advent focuses on the celebrations of the church to shed more light on why we celebrate, what we celebrate, and the way we celebrate. An intergenerational program also fulfills the promise we make as a church when we baptize a new member. At baptism, the Priest challenges the people with the following question: “Will you do everything in your power to assist this person in the promises they make today?” The people reply, “We will.” The best way to fulfill the baptismal promise is to join all of the generations together whenever and however we meet, whether we meet to worship, to enjoy fellowship, or to learn more about our faith and our God. Finally, studies show that formation is more effective when it is intergenerational. Children who have intergenerational experiences in the formation process are much more likely to continue to be part of the church as college students and adults. Everyone is welcome at GIFT, regardless whether they attend with family members or alone. Who should I contact with questions about GIFT? Call the church office at (440) 871-6685, or send a note through our contact form. What time does GIFT meet? GIFT follows the 10:00 a.m. service, and begins at approximately 11:30 a.m. Each session is approximately 90 minutes long, including lunch. Is registration for each monthly GIFT session necessary? Yes, so that the design teams in charge of the lunches know how many will attend. How do I register for a monthly GIFT session? You can register in any of the following ways: call the Advent office at (440) 871-6685, or sign up on one of the clipboards which circulate during Sunday services, or sign up on our contact form. When do I register for each monthly GIFT session? Please register no later than the Monday which precedes each GIFT session. Is lunch included with every GIFT session? Yes. A different design team will host a lunch for each GIFT session; this will not be a pot luck lunch. The lunch will be free. Can I volunteer to be on one or more of the design teams that will furnish lunch? Yes. Please call the office at (440) 871-6685 to volunteer for one or more design teams. Will lunch be served prior to or after the GIFT session? The lunch will be served before the GIFT session begins.